How are cells programmed to execute the complicated behaviors required to pattern tissues, form organs and facilitate cell dispersal during development and disease states? The study of morphogenesis requires an integrative understanding at multiple scales from single molecule to organismal and input from many research methodologies. 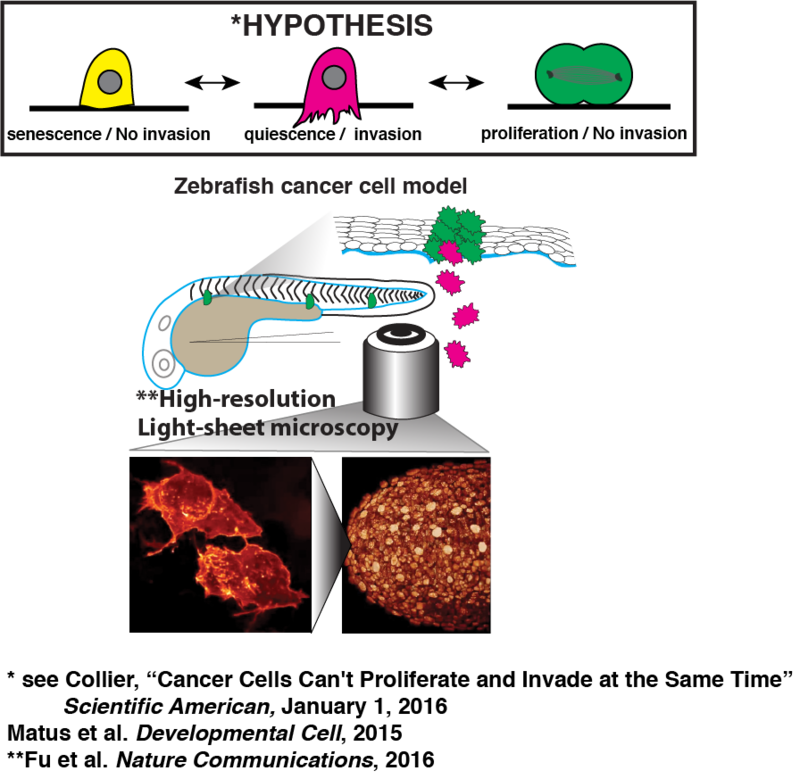 We are broadly interested in trying to understand how morphogenetic events are programmed during development, how these processes evolve between species and how they might go awry during pathogenic events such as cancer. We are using nematode uterine-vulval attachment as a model to understand how a cell acquires the ability to breach the basement membrane, an ancient form of extracellular matrix unique to the animal kingdom. Specifically, we are interested in the relationship between cell cycle regulation and the ability to breach, expand and stabilize a basement membrane breach. We use a combination of evolutionary, cell biological and developmental approaches to investigate nematode uterine-vulval attachment. We examine morphogenetic events at single-cell resolution using spinning disc microscopy in the model nematode C. elegans and are excited by the prospects of genome engineering technologies to begin to examine these morphogenetic events in less well-studied nematodes. 1. 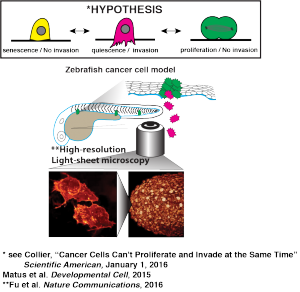 What are the transcription factors that are required to program cell invasive behavior? Through a combination of tissue-specific RNAi screening and bioinformatic approaches we are identifying and characterizing the set of of transcription factors that regulate different aspects of the invasive cascade, including F-actin regulation and activity, matrix metalloproteinase (MMP) gene expression and other invasive pathways. 2. How is the chromatin architecture regulated to allow for differentiation of the invasive phenotype? We have identified that the activity of a single transcription factor, nhr-67/tlx, is required in the AC to promote G1 cell cycle arrest, a prerequisite for the invasion program. Downstream of cell cycle arrest, we are now trying to identify the chromatin regulators that are required to regulate the expression of “invasive” genes. 3. How has evolution shaped the genetic networks and cell-cell signaling environment that mediates cell invasive activity? We have examine the process of AC invasion and basement membrane remodeling in related nematodes species, ranging from closely related Caenorhabditid species to more distantly related free-living nematodes, spanning several hundred million years of evolution. Collaborative research plan between the Matus and Martin labs to understand cell cycle regulation of invasive behavior. We have also recently secured funding to study cell cycle regulation of invasive activity in zebrafish and during cancer metastasis, in collaboration with Dr. Benjamin Martin’s lab (our next-door lab neighbor at Stony Brook University). Specifically, we are interested in understanding the regulation of switching between invasive and proliferative states during development and cancer cell dissemination. 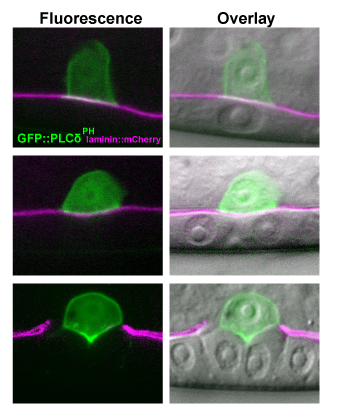 We will use a combination of high resolution in vivo imaging systems in C. elegans and zebrafish to examine the links between cell cycle arrest and invasive cell behaviors. The Matus lab is looking to grow! Please email us for possible graduate student and post-doc opportunities to join our group. Nick receives a postdoctoral fellowship award from the ACS! Matt and Angie are 2019 Regeneron STS Scholars! The Dave Matus Band had a busy week at ASCB 2018!